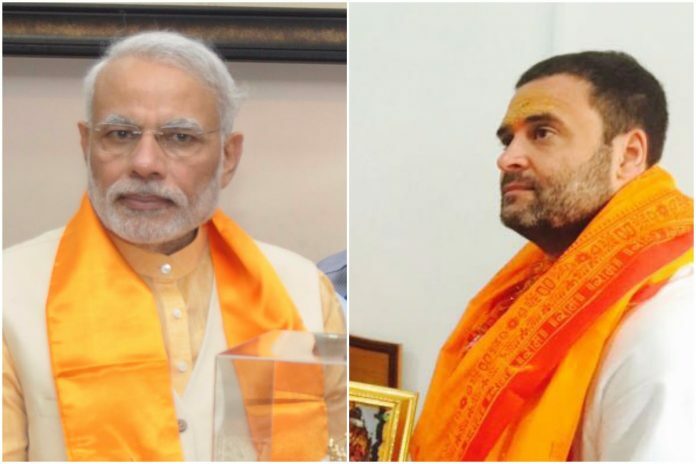 Narendra Modi at Durgiana Temple, Amritsar (PTI ) and Rahul Gandhi at Hanuman Garhi Temple, Ayodhya. | Getty Images. The principle of the performance of secular identity has now been replaced by the performance of Hinduness as the necessary condition for political leadership. Whatever the outcome of the imminent Gujarat assembly elections and the 2019 general elections, the BJP has already won the more important game in Indian politics. That game involves profoundly reframing the terms of political debates. The recent brouhaha over Rahul Gandhi’s religious identity sparked by his innocuous act of signing an entry book at the Somnath temple, is a textbook example of the BJP’s victory. The principle of the performance of secular identity has now been replaced by the performance of Hinduness or Hindu identity as the necessary, if not sufficient, condition for political leadership and, more fundamentally, even for belonging in the Indian nation. The BJP has effectively managed to change the logic of the political field and the currency of political capital in India in significant ways. Sociologist Pierre Bourdieu describes society as composed of different domains of experience or fields, such as the economic, cultural, political, and educational. Each field has its own currency, which is largely an inheritance of the particular history of the society. Participants in each field compete with other each for capital but importantly also compete to change the very notion of what counts as capital to capture or monopolise capital. It is with regard to this second aspect that the BJP has managed to pull off a remarkable achievement. The architects of the decolonised Indian state anchored political belonging to an idea of secularism, which, they felt, reflected India’s pluralistic, multi-faith ethos and history, warts and all. This idea would also ensure that all Indians, regardless of faith, could claim the nation as their own on equal footing. In this matter, Nehru, Gandhi, Ambedkar, Patel, and others, were essentially in agreement. Savarkar, the pioneering ideologue of Hindutva, offered a deeply contrasting perspective in his claim that Hindu identity was a necessary precondition for political belonging as well as political authority in the modern Hindu nation. For a large part of India’s post-1947 history, the performance and public affirmation of this principle of secularism, even if hypocritical and inconsistent, has been part of political life. Arguably, this is what has allowed the Congress and other parties to engage in soft Hindutva or religious identity politics while claiming to protect and endorse secularism. But even with its hypocritical invocations and inconsistencies, that principle has generally served the purpose of quarantining religious minorities from pervasive suspicions of disloyalty or questioning their very entry in formal political life. Starting roughly in the 1980s, with the ramping up of the Ram Janmabhoomi movement, the main principle of the Indian political field has steadily been challenged. States like UP did witness rank communalism in the build up to the demolition of the Babri Masjid in 1992, and the history of inflammatory speeches and political rioting by Indian politicians is well known enough to not warrant repeating here in detail. Indeed, one may have believed that secularism as a bedrock of Indian political life was strengthened again under the UPA regime from 2004 to 2014. But the speed with which the political stakes have changed since the ascendancy of Modi as Prime Minister in 2014 suggests that the principle of secularism itself may have lost enough legitimacy that even its staunchest advocates seem to lack conviction when they invoke it. Under the Modi-Shah dispensation, the new sine qua non for participation in public political life is a defence and endorsement of Hinduness, by both Hindus and non-Hindus, but especially if one is not a Hindu. This test, dutifully administered by government officials and an infatuated or cowed-down media, is applied to politicians, whether Rahul Gandhi or former Vice-President Mohammad Hamid Ansari, celebrities like Aamir Khan who may speak up against the climate of intolerance, and critics of the government who are described as anti-Hindu, deracinated Hindus, and so on. It is the same sentiment that in ugly and brutal ways manifests itself in lynchings of Muslims on false pretexts of cow slaughter and assaults on Dalits, who exist precariously at the limit of Hinduism. Rahul Gandhi should have stood his ground and said that his religion was no one’s business. From a strategic viewpoint his office, however, decided to play safe. But they had arguably already conceded the ground to the BJP on the matter of the political salience of the Hindu identity of leaders in India when Gandhi decided to visit the Somnath temple in the first place. In both these acts, Rahul Gandhi has tacitly acknowledged that something fundamental to the nature of Indian politics has firmly changed. And shifting the goalposts again will be a daunting task.